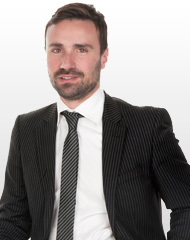 Alexander Rammos - Ballas, Pelecanos & Associates L.P.C. Alexander Rammos is an Associate, member of the Public Law, Procurements and Special Sectors Group, as well as of the Litigation Group of the firm, with focus on international arbitration and alternative dispute resolution mechanisms. Alexander is member of the Athens Bar Association since 2005 and entitled to argue cases before lower Courts. A graduate of the Athens University Law School (LL.B), Alexander earned a Master of Laws degree (LL.M) from the same University in Public Law, following which he was awarded a second Master of Laws degree (LL.M) from the Geneva Graduate Institute of International and Development Studies and the University of Geneva in International Commercial Arbitration. Alexander has served as counsel for foreign law firms, as well as for the Greek Government and is currently Teaching and Research Assistant at the Athens University Law School, working on his PhD thesis on European public law related issues. At Ballas, Pelecanos & Associates L.P.C., Alexander advises and litigates on all aspects of public and administrative law with particular emphasis on public procurements and regulatory issues. Alexander is actively involved in international arbitration cases handled by the firm on both procurement and construction disputes.